Savannah, GA – June 3rd, 2015. 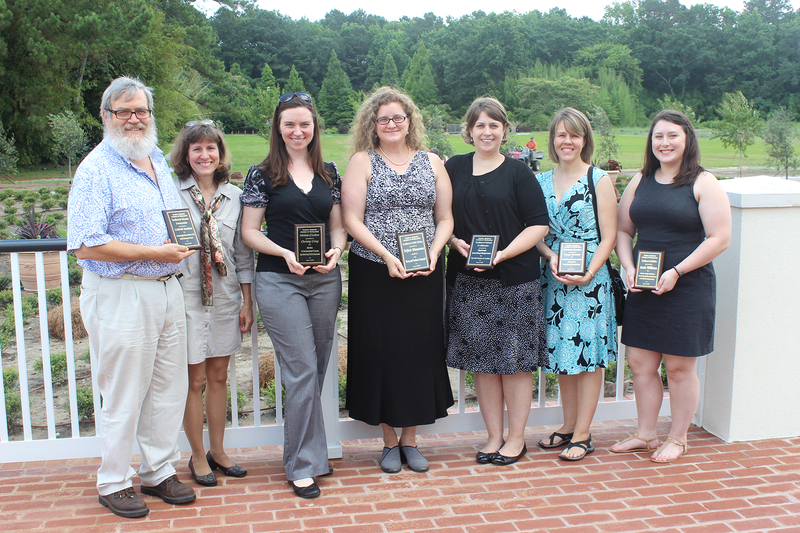 The Coastal Museums Association (CMA) held its second annual CMA Awards of Excellence on Wednesday, June 3rd, 2015 to recognize the exceptional educational and cultural programming delivered by local museums and cultural institutions during the 2014 calendar year. The event was held at the Coastal Georgia Botanical Gardens at the Historic Bamboo Farm. Excellence in Education & Interpretation to LAMAR Institute for archaeological excavations at the Isaiah Davenport House Museum. LAMAR Institute staff took advantage of Davenport House Museum’s need to remain open during excavations to educate the general public on archaeological methods and the importance of urban archaeology in reconstructing the past through excavation. Excellence in Public History to Telfair Museums for “Slavery and Freedom in Savannah,” a national publication, museum exhibition, and three-day city symposium. Building on 20 years of collaborative work by museum professionals, academic historians, and historical archaeologists, “Slavery and Freedom in Savannah” invited people to see a more complete story of Savannah through the lives and histories of non-whites and non-elites. Excellence in Outreach & Collaboration to City of Savannah, Research Library & Municipal Archives for City Hall Student Art Exhibits. Prompted by Mayor Edna Jackson’s request to bring more local art into City Hall and a desire to reach out and engage local youth, the Research Library and Municipal Archives organized art competitions for local high school and college students that resulted in three long term/permanent exhibits in City Hall. Excellence in Exhibition to Annie Williams for the Bamboo Artifacts Collection at the Coastal Georgia Botanical Gardens at the Historic Bamboo Farm. Annie Williams worked diligently to properly identify and describe objects in the Bamboo Artifacts Collection in completion of her graduate certificate in public history from Georgia Southern University. Williams is currently developing an online exhibit to engage the public in her research and findings. Two Individuals of Excellence awards were given for service excellence above-and-beyond to Christy Crisp at the Georgia Historical Society and Lacy Brooks at the City of Savannah, Research Library & Municipal Archives. The Coastal Museum Association (CMA) is a 501(c)(3) non-profit membership organization founded in 1984. CMA is comprised of museums and cultural sites from Savannah and the surrounding coastal area. CMA is dedicated to serving its members by providing a forum for networking, discussing issues impacting the museum community, exchanging ideas and experiences, and facilitating professional development. CMA meets from September through June on the first Wednesdays of every month. Museums, cultural institutions, and individuals are encouraged to join our community. Photographed from left to right: Daniel Elliott and Rita Elliott, LAMAR Institute; Christy Crisp, Georgia Historical Society; Tania Sammons, Telfair Museums; Luciana Spracher and Lacy Brooks, City of Savannah, Research Library & Municipal Archives; Annie Williams, Coastal Georgia Botanical Gardens at the Historic Bamboo Farm.